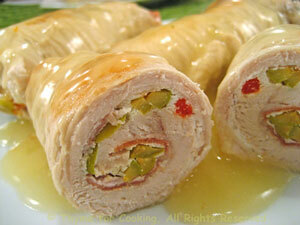 Turkey Rolls Stuffed with Ricotta and Olives, Thyme for Cooking easy gourmet. The nice thing about the ricotta is, unlike other cheeses, it stays in the roll... If you can't get thin turkey cutlets, you could use veal cutlets or chicken breasts, pounded thin. Divide ricotta and spread evenly, to 1/2" (1cm) of edges. Lay Prosciutto on top of ricotta. Spread olives on half of Prosciutto - they spread out more as you roll. Starting from one narrow end, with olives, roll up. Tie securely with kitchen string. Heat oil in medium skillet. Add rolls and brown well on all sides. Add wine, cover and simmer for 20 minutes.